Well, looks like another bust on the game project. I went away from the internet for about a week and came back, everyone was doing other things. I can't carry a project by myself, so off to do some work for my demo reel. Currently working on a little scene idea I had of an angry man. 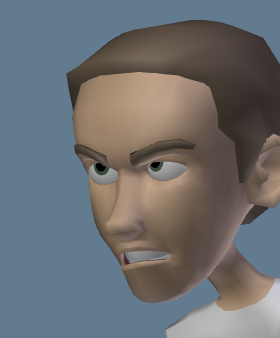 Using the very nice Cartoon Guy by Michael Edewaard in Blender 2.58. I've planned out the shot in my head and have begun working my "straight ahead magic", as I like to call it. I like to start on a project with the freedom of a straight ahead workflow. You often aren't allowed such creativity in the usual studio. But I'm working for myself this time, as usual haha. At any rate hope to get it done soon. What kind of game were you guys working on?